Penguins Gameday 1/3/10 - I bet it's Warmer in Fla.
Four in a row is only good if its a winning streak, or playing connect four; this Pens fans is getting a bit more serious. All teams in the NHL go through this, we discussed this last night. Good teams find a way through this, time to step up boys. Your getting out played, out worked, and last night you got out hit right off the first face off. One good way to end a losing streak is to play a team you know, a team for some reason if you play badly you end up beating. 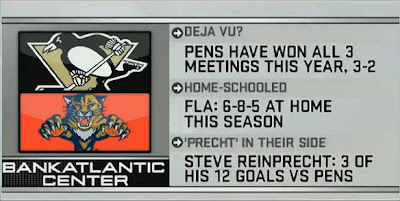 That team, this year, is the Florida Panthers. Hit early, hit often, then hit some more. 14.8% is not good enough, time to get going, or time to fire someone. Last I check Mike Yeo was the power play guy. I'd start packing.